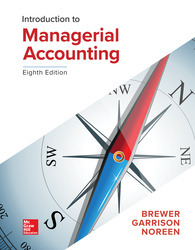 ·	What's Covered: All of the topics typically covered in an introduction to managerial accounting course. ·	Teaching Approach: Briefer and more student-friendly coverage of these topics than in competitors. ·	What Makes This Product Unique: Concept overview videos and integration exercises, guided examples and flagship end-of-chapter content, static and algo test bank, auto graded Excel simulations.